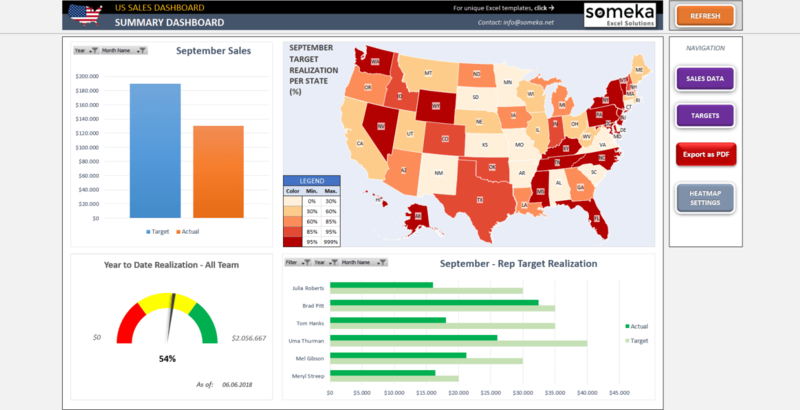 Sales Report Template in Excel with a professional visual dashboard. Track and analyze the US sales performance of your team! 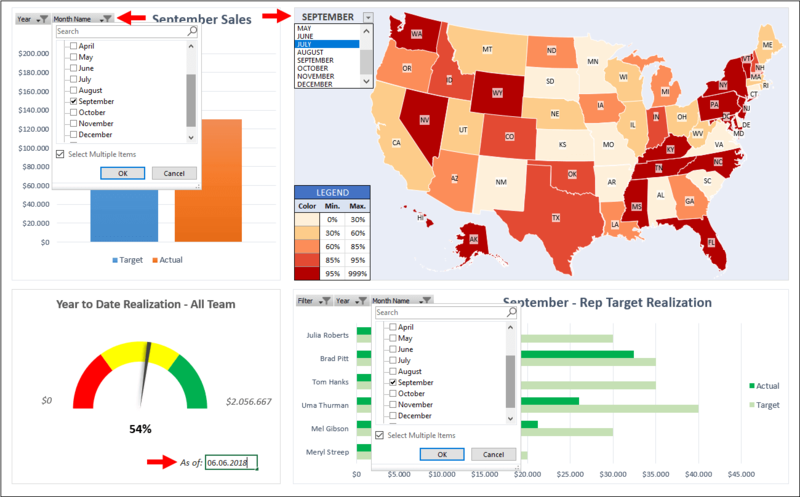 As a sales professional, you already know the importance of the reporting and analytics. It indicates whether your team is to meet their target or how they are performing. 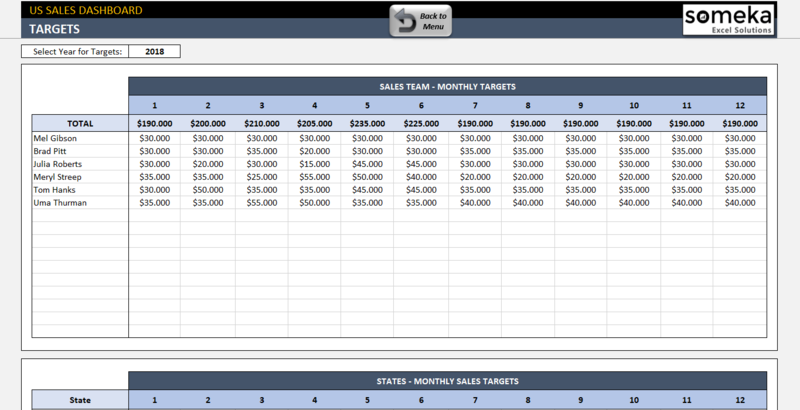 On the whole, you need to look beyond the number of sales you closed in a year. 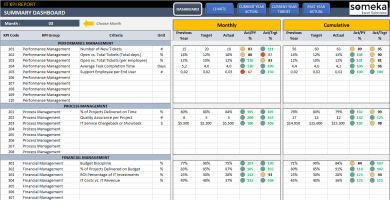 You need to create a clear sales report that gives you all the critical details about your sales team. That’s why US Sales Report Template presents very detailed visualized data that tell you everything you need. 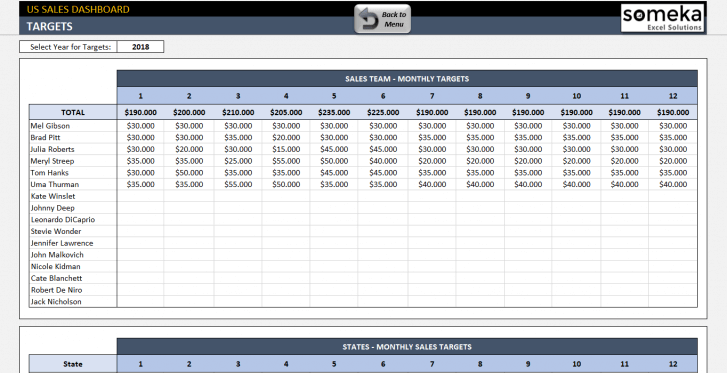 By using this ready-to-use sales report template you will analyze your data correctly and make well-informed decisions. Define your targets per sales person and per state at “Targets” section. Simply input your sales/invoices to the “Sales Data” section. Click “REFRESH” button after you make your inputs and go on your Dashboard! 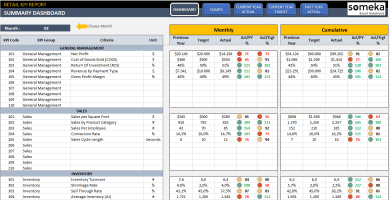 Now, lets start with reviewing the Sales Summary Dashboard of the template. 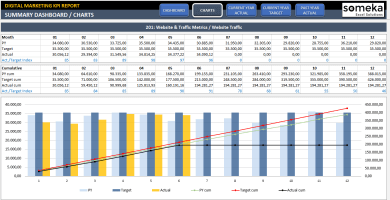 You will have 4 different visual graphics that present your sales performance. 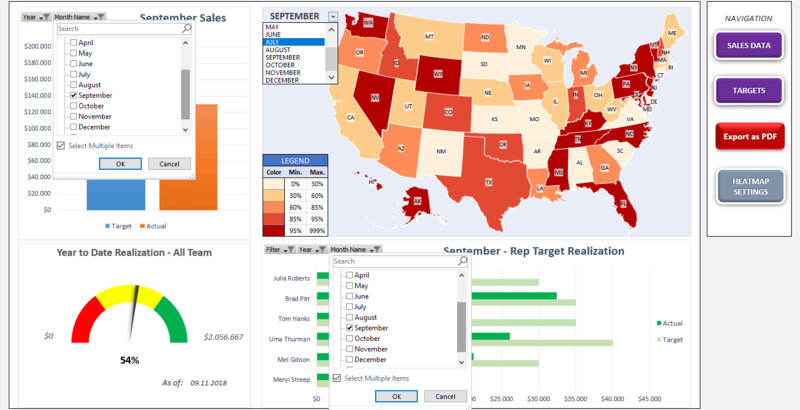 After you input your targets and sales data, the dashboard will visualize all your US Sales realization. By the way, you can customize your dashboard because each chart is provided with a month selector. You can either choose an individual month or multiple months. In Year to Date Realization, “As of”date is designed to measure all team performance until today’s date. 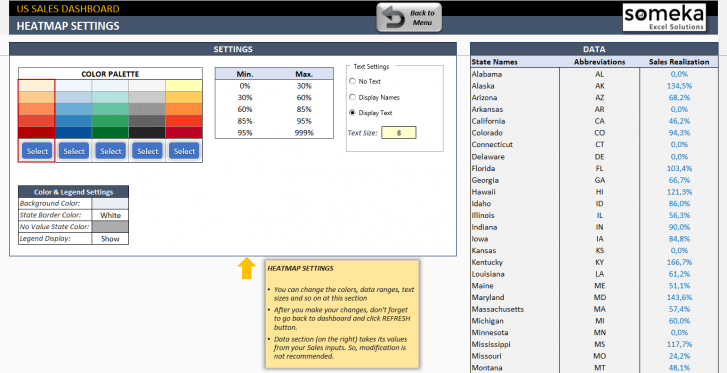 But you can select a specific end date to see your performance at a certain time period. Warning! 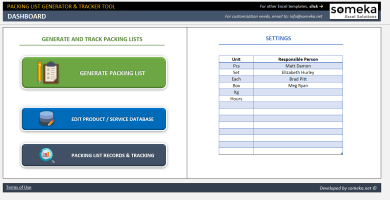 : Do not forget to click “REFRESH” button after your selections! 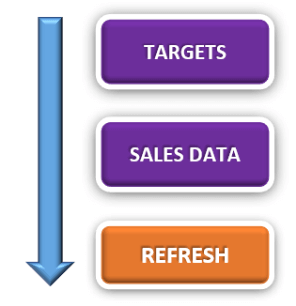 Achieving your sales target is a primary goal of your business. Therefore, you need to input a sales target for each rep in your team. 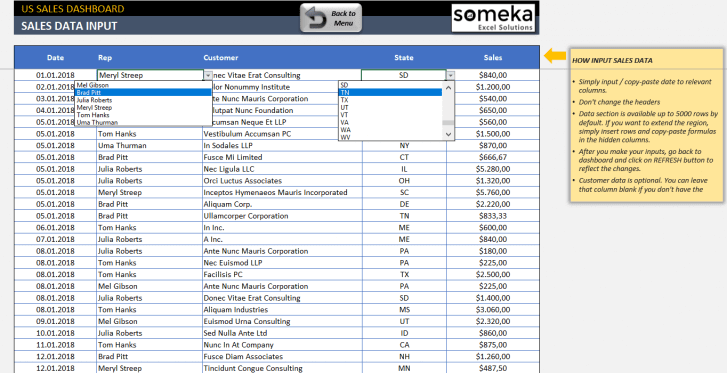 In this section, there are two different input tables. Sales Team – Monthly Target: Input here your Sales Reps and their monthly sales targets on a monthly basis. 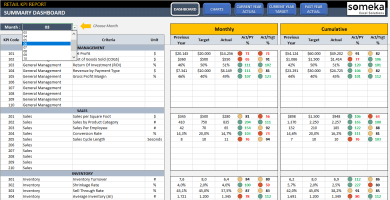 But first of all, you should select a year for the targets you want to input (this tool covers yearly realization). 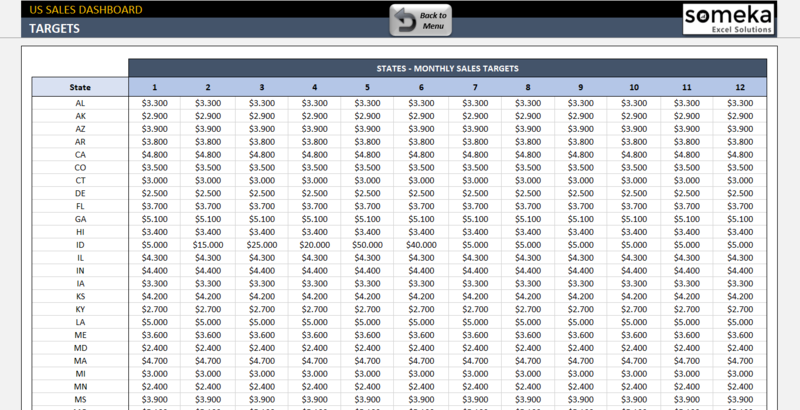 You can add new salespeople up to 16. 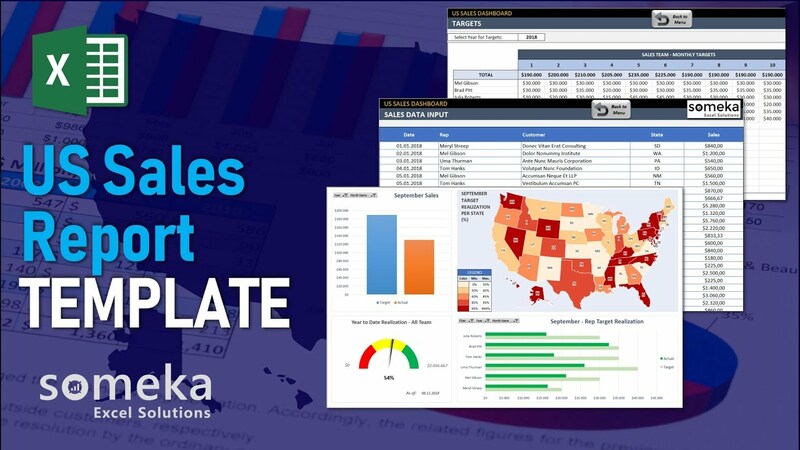 States – Monthly Sales Targets: Input here your total sales performance of each state on monthly basis. Warning! : After you make your inputs, go back to the dashboard and click “REFRESH” button to reflect the changes. 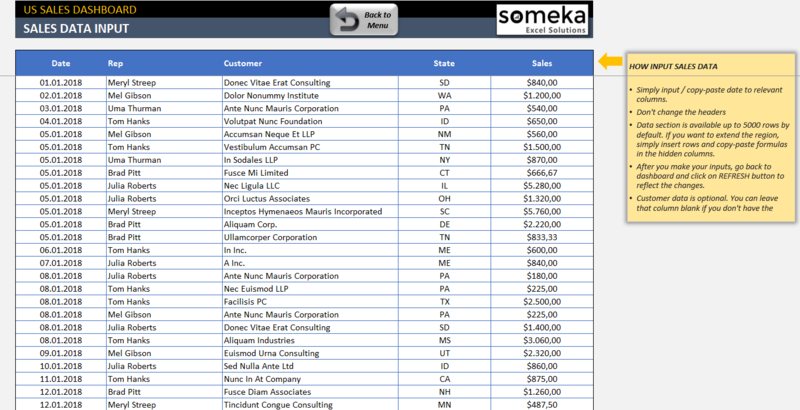 Sales data contains actual sales that your sales reps closed. 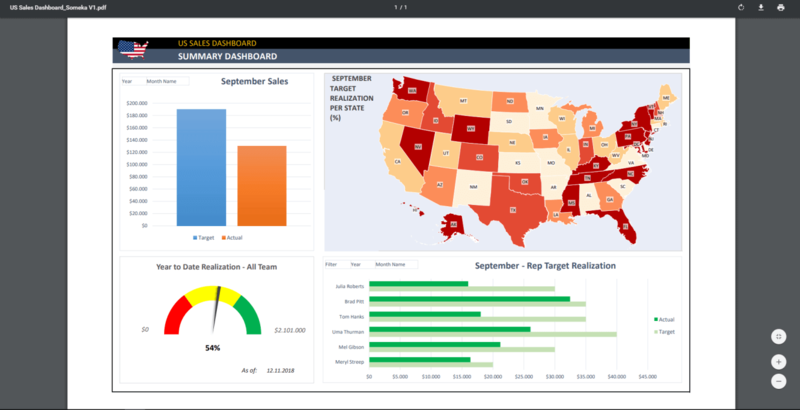 Besides that, it’s a kind of database that gives an important information like your customer details and historical sales data of your reps by state. 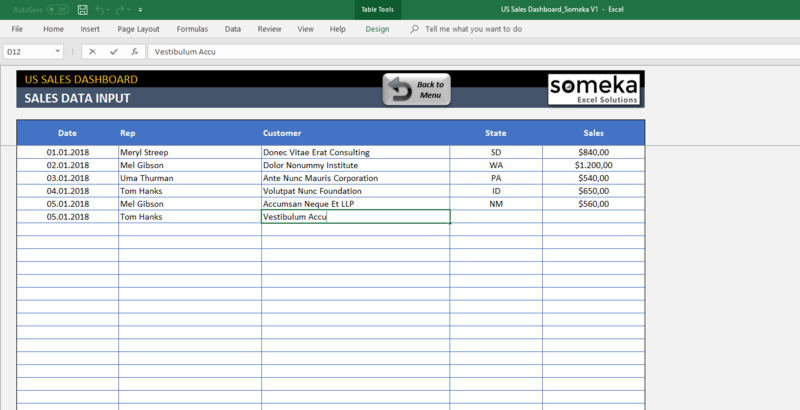 As default this section is available up to 5000 rows. 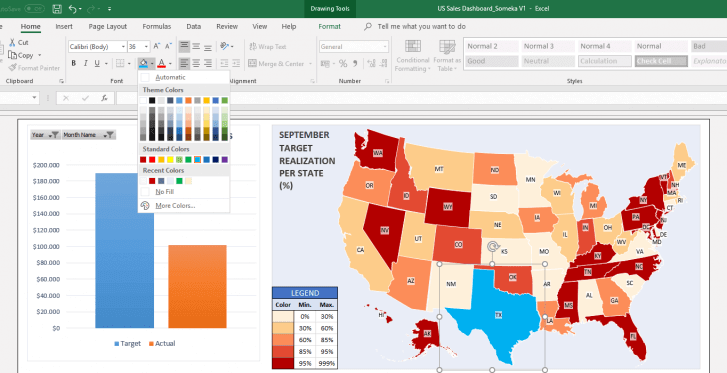 But, if you want to extend the region, simply insert rows and copy-paste formulas in the hidden columns. 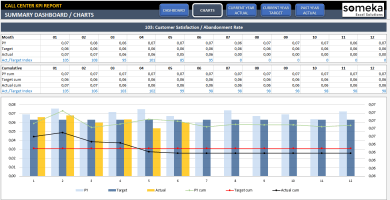 Customer data is optional. 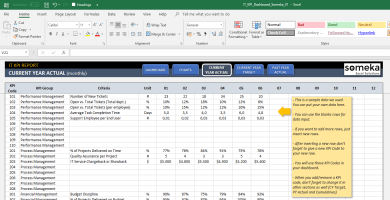 You can leave that column blank if you don’t have the data. Heat Map Settings: In this section you can change the colors, data ranges, text sizes of US Sales Heat Map on the Dashboard. But, Data section takes your sales values from your inputs on Sales Data. So, we do not recommend you to make any manual changes in there. 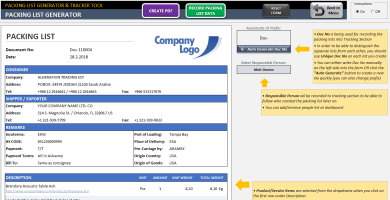 Export to PDF: When you finish your sales report, you can easily export to PDF by clicking this button. • No installation needed. Ready to use.